Thaifood and Thai restaurant . : Thai restaurant in Atlanta. Today I have a new Thai restaurant to introduce for every body . Thai restaurant is Surin of Thailand. 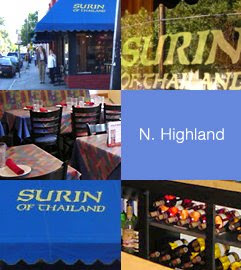 Surin of Thailand has been serving Authentic Thai Cuisine for fifteen (15) years to Atlanta and the Southeast. First and second-generation customers have enjoyed our family recipes and regional dishes of Thailand. His Master Thai Chefs’, hand select only the freshest local vegetables and meats and import select Thai spices, seasonings, noodles, nuts, rice, and authentic Thai ingredients to make your dining experience an epicurean delight. A broad spectrum of Thai Cuisine is offered on the Surin of Thailand menus and Chef Specials to meet our customers’ tastes, dining preferences, and dietary concerns. The experience of Authentic Thai Cuisine is coupled with a full Sushi Bar, a knowledgeable and professional wait staff, a full Martini Menu, varied wine list, and professional bartenders. Many of our Thai people are trained in Japan by professional Sushi Chefs and find an easy transition from our fresh, select, and “made to order” Thai Cuisine to our fresh, select, and “made to order” Sushi and Sashimi. Vigorous quality control, attention to detail, and “listening to our clientele” has provided our customers with a Thai experience that rewards their palate and dining enjoyment. Surin of Thailand has proven itself as an Authentic Thai Restaurant and has innovated, broadened, and evolved as our customers have continually evolved their palates, experiences, and preferences in Thai Cuisine. Surin of Thailand has been built upon his customer satisfaction and will continue to offer the best in Authentic Thai Cuisine, provide an exciting dining experience, but always demanding the freshness, consistency, and variety that our clientele expect. However, maybe the Surin Customers only return again and again for the Martinis and the “made from scratch” desserts…you decide. The Surin of Thailand family invites you to experience his commitment to his customers, the satisfaction of the Thai Culture, and the variety of Thai Cuisine, fresh Sushi, and all the extras provided to highlight your visit. Pad prik pork and much more.